For the last few days I’ve been settling back into the traveler’s routine. After my exciting first day, I decided to rein back in the adventures and do some sight-seeing. I started at the Topkai Palace, and like I anticipated, spent several hours wandering the rooms and courtyards. The mosaics inside and out were just stunning, and the views of the city were spectacular from that vantage point. Both the European side and the Asian side could be seen. After the Palace, I was in need of a rest and a snack. I got my snack in the form of a street cart. Many such carts can be found around the city, some selling steamed corn and some selling breads. More interested in the veggie, I tried a corn on the cob for 1 L. With tongs, the vendor adeptly flipped the corn into a waiting wrapper, salted it all around, and handed it off with a flourish. My Lira I dropped into the old barrel of corn water. Munching happily I wandered some side streets and found some small art galleries. Modern art in Istanbul is quite stunning, incorporating old themes (like the Whirling Dhirvish) with new mediums (like photography and oil painting). My walk led me to the archaeological museum, with its extensive collection of statues and pillars. I was particularly interested in the toga wearing goddess statues, and snapped some great pictures for costume inspiration later. After the museum I headed home to freshen up. That evening I was meeting Maree for drinks. Before that I needed to find myself some dinner. While kebab is good, I was ready for something a little more sophisticated. Taking the tram back to the historic district, I let my nose lead the way. Intrigued by a chef in the window, I wandered into a nondescript restaurant on the main road. Once again, my nose didn’t fail me. I ordered the cold mixed plate and the day’s soup- lentil. The lentil soup was unlike any I had ever had before. It had a strong brothy flavor and was served with a slice of lemon. Unsure of the lemon I tested one drop on a spoonful first. 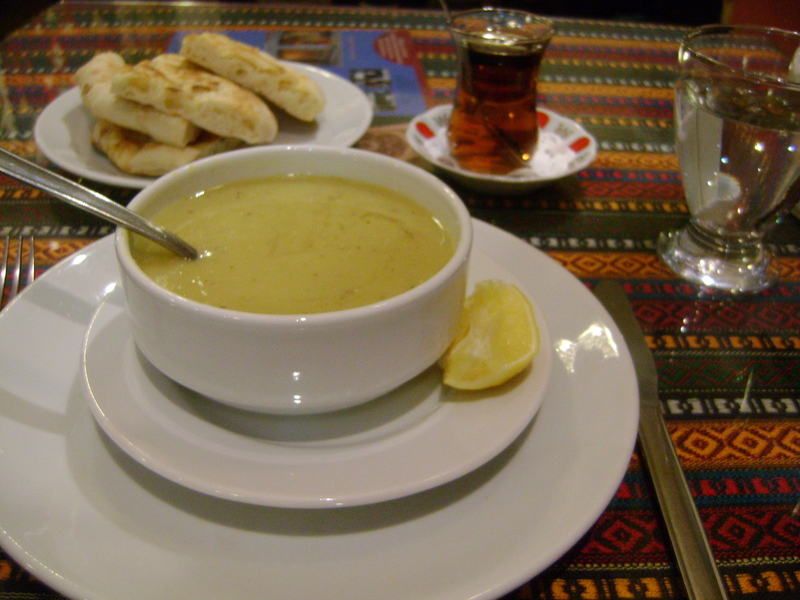 The combination of lemon and broth, with the thick heartiness of stewed lentils, was stunning. I happily squirted the rest of the lemon into the bowl, mixed, and enjoyed. The mixed plate was equally appetizing. Served with flat bread, the plate contained hummus, a thick taziki sauce, a spicy tomato spread, two egg plant dishes- one spicy and one sour- and something remotely similar to potato salad, but could never be given the name. Cucumber and tomato garnished the dish between spreads. In the center sat two dolmadas- spicy wrapped grape leaves. Anyone who has ever enjoyed greek dolmadas would be impressed with these Turkish ones, whose rice is a bit more spiced. Lentil soup with lemon juice...whoda thunk?! After enjoying my dinner (with tea of course) and paying the tab- 35 TL- I wandered over to Maree’s Hostel. She was staying at the Harmony Hostel, a cute cozy lodge in a great part of town. We had plans to go out for a drink, but instead picked up some beers from the mart across the street and enjoyed them in the hostel common room. The room was adorable, and the most relaxing, and stereotypical, Turkish experience I’ve had yet. Big fat pillows covered the floor, surrounding low tables. A wood burning stove stood in the corner, which we promptly lighted for warmth. Maree and I discussed travel plans, and decided to go together on a coastal tour to Canakkale and Troy, and maybe over to Cappadocia Province. Though out the evening we were joined by another Australian girl, the Turkish hostel manager, a Syrian sculpture artist, and a Malaysian amateur antique buyer. This right here is the best part about hostels. Stomach the group bed-rooms, pinch your nose at semi clean bathrooms, and grumble when the food you’ve left in the fridge gets eaten. But at night, come home to a cozy common room and share some beers with people from around the world, and somehow its all worth it. Of course you start out talking about traveling, and finally you’re surrounded by your peers. You can tell your most bogus, absurd adventure stories and your listener can commiserate. If you’ve got a good crowd, as we did this night, the conversation will wander into more serious topics and you’ll be amazed at the things you’ll learn. This night I fell deep into conversation with the Syrian artist, discussing- of all things- women salesmen, love versus lust, and the subjectivity of emotions. Much later, coming back into our surroundings, we realized the beer was gone, and I wasn’t actually BOOKED to stay at this hostel. Taking my leave of the group, and agreeing to meet Maree for our trip, I again hopped in a taxi for the short ride home. All in all I ended my day just slightly over budget, but again every dollar was money well spent. The next day, Friday, I wrapped up my Istanbul Tour. By the evening I found myself in Taksim square again, this time wandering the shops more leisurely. I also discovered that the path, closed to cars, filled with street musicians in the evening. I enjoyed each one for several minutes, buying CDs from some of the better bands. At 10 Lira a pop, I can afford to be a firm supporter of these arts. Home early, packed, and in bed shortly, I excitedly awaited our coastal tour in the morning. That would be this morning. Maree, Sam (the other Australian gal from the night at Harmony Hostel), and I met at the metro stop and continued on the the bus station. The station was huge- a long strip of bus companies, each with their own ticket office. We chose Metro bus, recommended by the hostel manager. For 35 TL we could make it to Canakkale, a small island in the Aegean Sea. Maree had done her couch surfing research and we would be staying with a couple of young university students for the night. When we hopped off the ferry we wandered over to the tourism office for directions to the flat. We were told bus C3 would take us there, and it was only a block or two from the stop. C3 was easy enough to find, but the stops were less well marked. 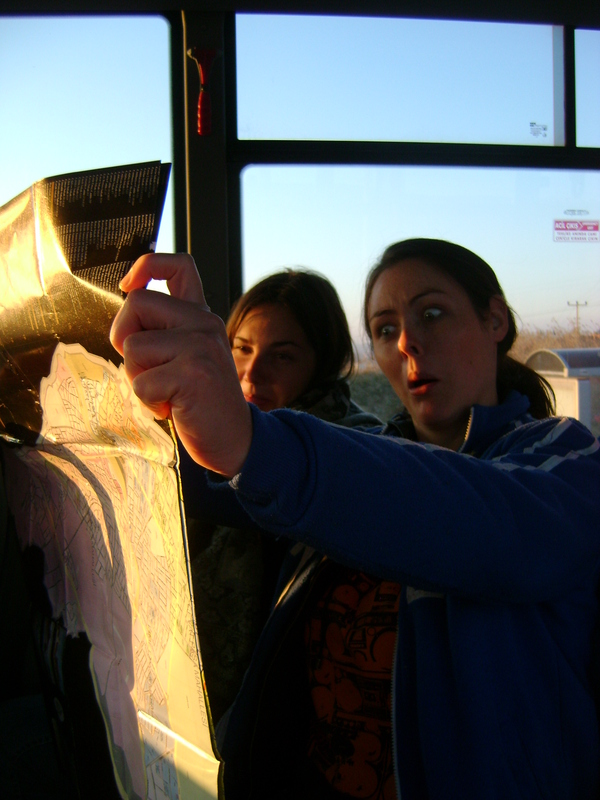 We rode the bus to the very end of the line, and had the whole bus trying to help us find the flat on the map. Luckily the driver let us stay on for the return loop and we hopped off at the right stop the second time around. When we arrived, we checked in with Tahir and Adam, our hosts for the night. We had passed a grocery store on our walk from the bus stop and after dropping our bags we wandered back to the store to hunt for dinner. With access to a clean kitchen, we went fresh, and picked up some veggies, cheese, bread, and yogurt. For 21 L we had enough food to feed the five of us. I’ll talk more specifically about the grocery store experience in a future post. It can be quite epic and deserves its own space! After dinner, Adam’s friend Frantz came to round out our group. Though the boys spoke little English, and we spoke even less Turkish, we had a good evening. With pantomime, Google translate, and general good humor almost anyone can get along for an evening. We also took the time to learn some more important Turkish words. ‘Thank you’ is always the first phrase I learn in any new country. In turkish it sounds like “tea-sugary-dreams”, or “tea-sugary” for short. Yes, no, and help are petty universal with body language, but ‘thank you’ can be tough. Cheers is another good one to learn quickly too, especially when sharing a pint in a pub. Why, you may ask, have I spent so much time describing this day? Because it is full of wonderful examples of more crucial travel tips. Learn the Metro System: Part of your mission in the first few days is to figure out how to navigate the city’s public transportation. It is often the quickest (yes even quicker than a cab if the city has traffic- as most cities do), and cheapest (again, certainly cheaper than a cab) way to move about town. Cabs are OK to hire at night, after the metro has closed, or if you’re uncomfortable walking to and from the metro stations; but often they are unavailable in the morning. Paying 2 L and hopping on the metro was the best way for us to get to the bus station this morning. Also, it provided a convenient meeting point for three ladies without cell phones. Travel by bus at least once: The bus is a great way to travel between cities in a country. The train is a good choice too. They both travel slowly and offer a great opportunity to view the passing countryside. This bus ride was no exception, and we spent several hours driving past fields and the winding along the coastline. We were even able to top off the trip with a surprise ferry ride. Learn a few key words in the local language: like I said before, ‘thank you’ is always the first phrase I learn. Other useful ones are please, yes, no, help, how much?, the first few numbers…oh and Cheers! Being able to say thank you in the local language is a fantastic way to be polite and really reinforce your gratitude. All in all it was a great day. I got to see much of the countryside, rest my tired legs from days of intense walking, and meet some new friends in a warm and welcoming home. Oh, and I did it all for only 55 Turkish Lira/$30.55. Way under budget for the day! Up next- Ancient Troy. Serefe! Hi Aeri, this is my second post, after the first one I posted as a reply to your 11-15 blog. A guide book haggled down from 26 to 5 TL?!?! W-O-W! Yay for you! I may have told you this, but when I was in Turkey (Kusadasi and Ephesus, in the summer of 2006), I was amazed at how aggressive the merchants were. They just would not take no for an answer, even when I wasn’t interested in anything in their store. I’d be interested to hear about your experiences/thoughts if anything similar happens to you. So far it seems like you’ve had all positive experiences. Again, I like the tips you’re posting… They sound smart, like good old-fashioned common sense (learn the metro system, learn a few words in the native language, etc.). You sound like a smart traveler, and I’m sure there’s a lot of dumb ones.